Increase blood flow and circulation throughout knees,thigh and foot. Help your muscles recover faster from weight training and general soreness. Provide mild pain relief from over-use, bursitis & tendonitis. Treat lymphedeama and help improve blood flow. Shield yourself from harmful UV rays without using greasy lotions. Use as a rash guard and protect your knees from minor scratches and abrasions. Easily regulate body temperature with these easy on-easy off comfy sleeves. Wear as a base layer for added comfort as knee warmers. Stay dry & cool when sweating with this wick away knit. Basketball,Baseball,Obstacle course runs Savage,Drive,Cycling,Football,Golf,Skiing Skating,Weight Lifting,Boxing & MMA,Hiking and a lot more. COOLOMG was registered in the California,United States in 2014.Our design team all graduated from local designers, focus on design unique functionality products. We pay more attention to products,select the finest fabrics,use security dying technology, follow strict ISO production process. Our customers always be amazed our products as we have better quality than the expensive items. Since 2015,we became a one of the best vendor of Amazon. Since 2016,We are invited to be the vendor of Walmart.SOLD BY AMAZON and COOLOMG TECHNOLOGY is legally authorized online dealers. Continuously improve ourselves, provide the most comfortable,stylish professional sports products with customer is the power to provide best service in the future. Remember COOLOMG - More focus, More excellent! Package Included:Pair (2PCS).Thanks for the suggestion and support from all our COOLOMG customers.According to the former data we have updated the size chart on 3/26/2018.Hope to bring you excellent expreience. Fit tensile strength for basketball,baseball,football,outdoor & indoor etc. UV protection over 98%. Sold as 1 sleeve (not a pair).......Sizing: For a proper fit, measure the top of bicep with the arm relaxed. Note: All sizes measured in inches. YS 8-9.0 , XS 9-11 , S/M 11-12.5 , LG 12.5-15.5 , XL 14-16 , 2XL 15.5-17 , 3XL 16-19 ........ Perfect Fit Guarantee: Because there are many arm sizes, sometime a sleeve will not fit perfect, even if the bicep measurement is carefully selected. In this case, simply contact B-Driven Sports directly and we will send you a pre-paid label for a free exchange. Thats our guarantee to making sure you are fully satisfied with the product. Specifications..... RE-ENFORCED SILICONE ELASTA BAND, providing anti-slip performance. UPF 35+ protection from the sun. HD print technology providing high definition detail and vibrant colors. Flat-lock seams add comfort and chafe free performance. 220 GSM fabric is 30% stronger than most arm sleeves. Stay-dri fabric provides moisture wicking comfort. Anti-Bacterial providing order free use. 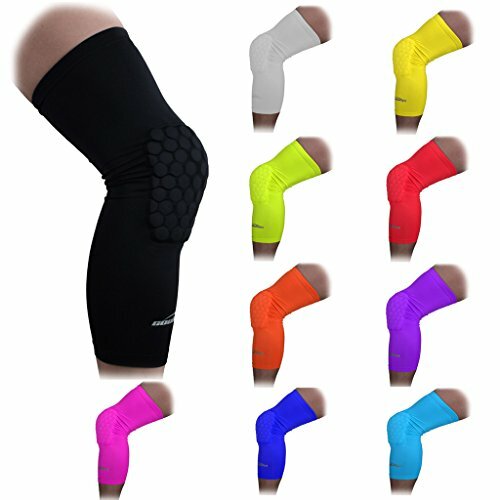 Benefits: A wide range of people use our sleeves for multiple purposes including: UV protection, Increased blood circulating, Injury prevention through muscle support and muscle vibration reduction, Reduced swelling and inflammation, Joint relief, Skin blemish cover-up, Moisture Wicking promotes comfort. Great for sports, athletics, and general-purpose use........ B-Driven Sports: We are a family owned business 3 generations strong, located in Central Minnesota. We pride ourselves in customer service and love communicating with our customers. If you have any issues, questions, or concerns, we are ALWAYS happy to talk with you. Non-Slip Elastic band, 35+ UPF Sun Protection, Moisture Wicking, Medium Compression. Great for Sports and promoting fast recovery and injury prevention. Excellent for everyday protection and relief from muscle and joint pain. 100% RISK FREE GUARANTEE: We are a 3 genration family business from central Minnesota. Whether it's a size exchange, a warranty claim, or simply a return, contact us dirrect and we'll make sure there is no cost associated with any return or exchange. It is no coincidence that top athletes across the U.S., in almost every sport, are wearing Bucwild Sports compression arm sleeves. 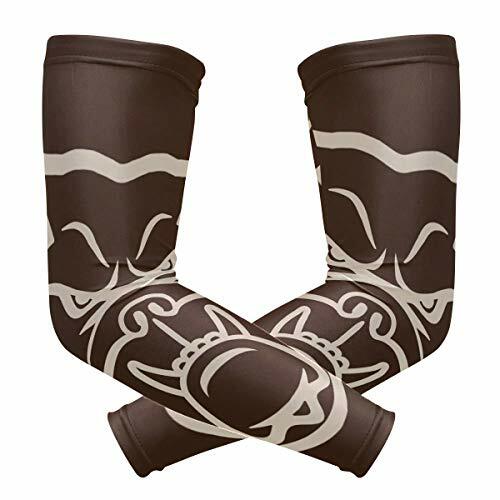 Our arm sleeve is a great investment for any athlete who wants to perform at their highest level, and as an added benefit they look pretty cool as well. Note: Purchase is for (1) Sleeve. Improved Circulation: Good circulation can protect muscles from future injury, and provide support for athletes with a previous injury. Faster Recovery: Allows blood flow to circulate quicker to the heart, which aids in recovery from intense workouts. Maintain Warmth: Keep muscles warm thus maintaining the right temperature and flexibility which boosts performance. Protection: Provide protection against bumps, scrapes, and UV rays. For a perfect fit, measure the relaxed bicep and choose the size that matches your bicep measurement. If measurement falls in between two sizes, choose the larger size. Measurement chart can be found under images. If you need help choosing correct size we will be glad to help you. 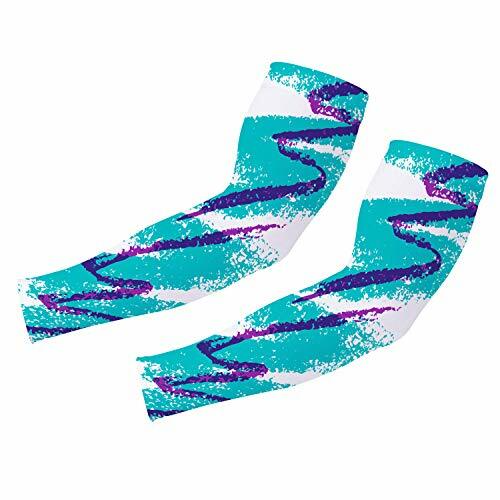 If your arm sleeve does not fit we will exchange for free. 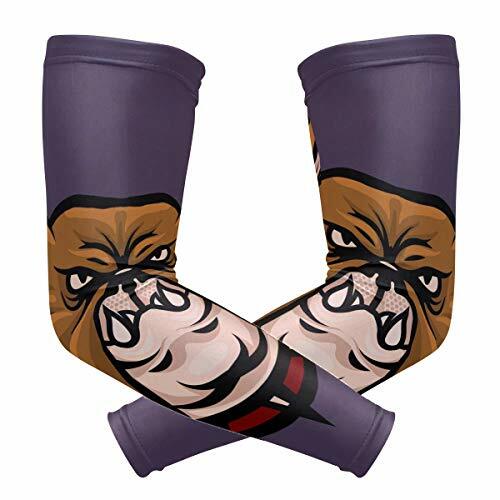 Youth Small (YS): 6 - 7"
Youth Medium (YM): 7 - 8"
Youth Large (YL): 8 - 9"
Adult Small: 10 - 13"
Adult Medium: 13 - 15"
Adult Large: 15 - 17"
All arm sleeves listed are manufactured, designed, and distributed exclusively by Bucwild Sports. Bucwild Sports Compression arm sleeves were designed by extreme athletes to be worn comfortably all day long for all day cooling compression. To guarantee you order a perfect fitting sleeve please measure the largest part of your bicep, and choose the size that matches your bicep measurement. XS (Youth):Bicep 6-8" - Sleeve Length: 12"
Small (Youth):Bicep 7-9" - Sleeve Length: 14"
Small/Med (Adult):Bicep 10-13" - Sleeve Length: 16"
Large (Adult):Bicep 13-17" - Sleeve Length: 18"
Wicking material provides cooling effect and UV protection in the summer and acts as an arm warmer in the winter. Perfect for: baseball, basketball, football, cycling, running, golf, tennis, bowling and more. Youth and Adult sizes available. See measurement chart below or in images. Sold as 1 pair)......Sizing: For a proper fit, measure the top of bicep with the arm relaxed. Note: All sizes measured in inches. YS 8-9.0 , XS 9-11 , S/M 11-12.5 , LG 12.5-15.5 , XL 14-16 , 2XL 15.5-17 , 3XL 16-19 ........ Perfect Fit Guarantee: Because there are many arm sizes, sometime a sleeve will not fit perfect, even if the bicep measurement is carefully selected. In this case, simply contact B-Driven Sports directly and we will send you a pre-paid label for a free exchange. Thats our guarantee to making sure you are fully satisfied with the product. Specifications..... RE-ENFORCED SILICONE ELASTA BAND, providing anti-slip performance. UPF 35+ protection from the sun. HD print technology providing high definition detail and vibrant colors. Flat-lock seams add comfort and chafe free performance. 220 GSM fabric is 30% stronger than most arm sleeves. Stay-dri fabric provides moisture wicking comfort. Anti-Bacterial providing order free use. 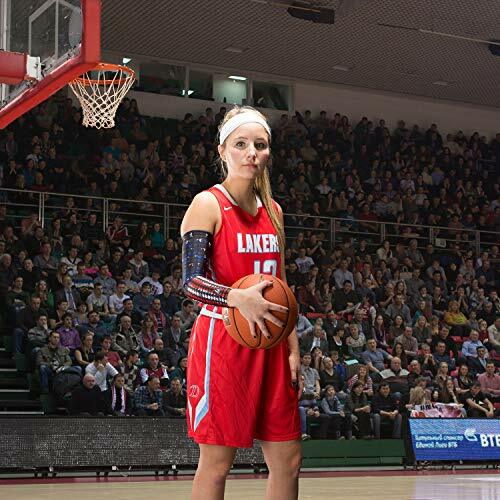 Benefits: A wide range of people use our sleeves for multiple purposes including: UV protection, Increased blood circulating, Injury prevention through muscle support and muscle vibration reduction, Reduced swelling and inflammation, Joint relief, Skin blemish cover-up, Moisture Wicking promotes comfort. Great for sports, including baseball football basketball and other athletics, and general-purpose use........ B-Driven Sports: We are a family owned business 3 generations strong, located in Central Minnesota. We pride ourselves in customer service and love communicating with our customers. If you have any issues, questions, or concerns, we are ALWAYS happy to talk with you. Choose your pair... 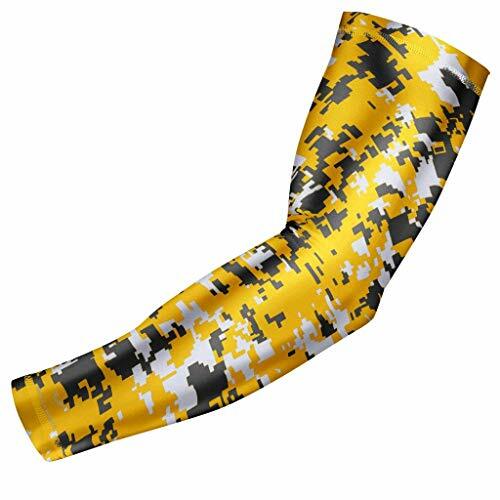 Whether you need a solid black shooter sleeve or a USA Flag design, we have everything from Digi camo, Camouflage, to Breast Cancer awareness, and faith-based designs. Styles for all ages from Youth to Adult, boys to girls. Moisture-wicking fabric means breathable comfort, while cooling in the heat, warming in the cold. Great as a golf sleeve or shooter sleeve to keeping your hands drier when you sweat. Constructed with our anti-slip silicone band for stay-in-place performance, along with a flat stitch seam for irritation-free use. 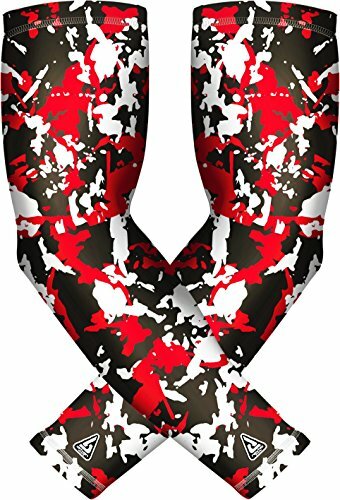 "Bright colors hold up well to washing"
"This is a great armband sleeve"
"The colors are extremely bright and colorful"
Compression fabric will stretch and conform but for more muscular builds go one size up. 100% MONEY BACK GUARANTEE: Backed by Amazon's famous 100% no hassle money back guarantee. SIZING INFO: see description below. BEST FIT AND DURABILITY: Compression not constriction. Thirty48 has designed the optimal combination of firm compression to support ligaments and stabilize the Achilles. As well as light and moderate compression to increase bloodflow and recovery. 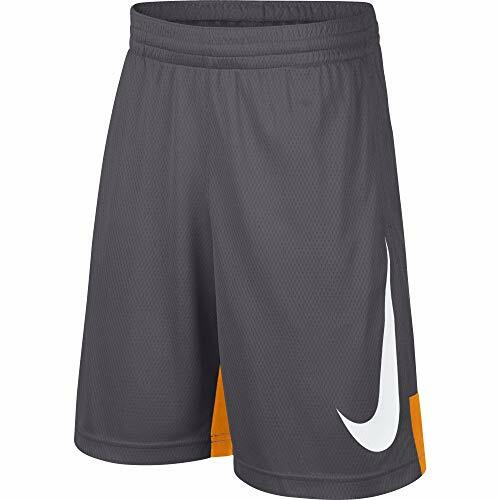 Made with thin yet durable anti-bacterial, anti-odor nylon the sleeves are reinforced with seamless stitching and tear resistant lycra formula that are non-slip and will not fray, nor lose its elastic properties which can negatively performance. 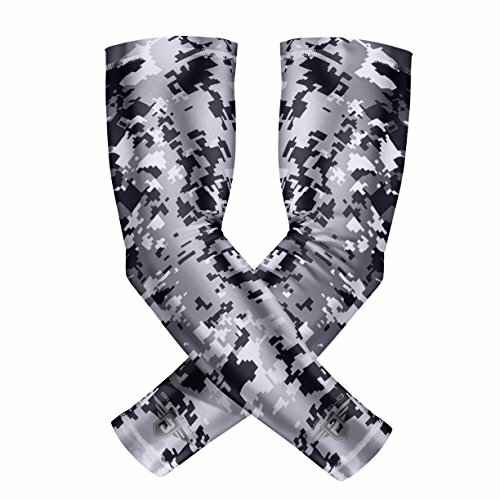 BEST SLEEVES: Our high quality compression sleeves make a great addition to your workout gear for hiking, running, cycling, basketball, football, crossfit, weight lifting, and many other sports that force your blood to pump quickly. 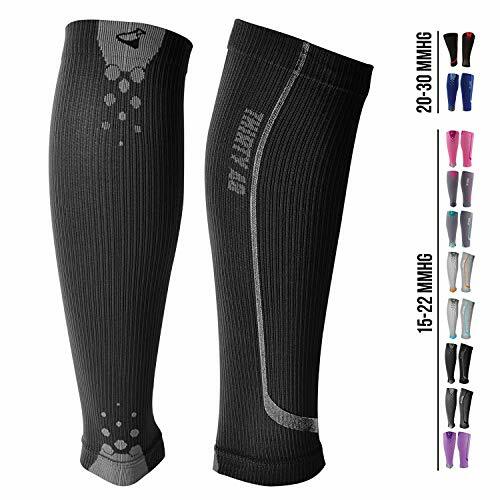 Thirty48 compression sleeves are available in 15-20 mmHg or 20-30 mmHg. Choose your compression based on performance and recovery needs. MOISTURE WICKING TECHNOLOGY: Thirty48 compression sleeve are breathable, made with CatalystAF, a patent pending technology which allows increased airflow within the channels of the sleeve's stitching. In combination with our COOLMAX fabric, be ready for an unparalleled feeling of cool, dry comfort that prevents any stickiness. QUALITY WITH A GUARANTEE: You can purchase our compression sleeves with absolute confidence. We think that you will love our sleeves, but if you are not happy for any reason, you are covered for the first 90 days with our satisfaction guaranteed policy. Our top rated customer service is standing by to answer your questions and resolve your concerns. ***Athletic Fitness Versatility & Outdoor Activities*** - Running - Golf - Basketball - Baseball - Football - Volleyball - Tennis - Cycling - UV Protection - And all types of activities! In summer with its cooling & UV protection features, you can be rest assured being protected while doing all sorts of outdoor activities all day long. In winter it can also be as arm warmers by wearing them under a jacket to keep you warm. They are cooling sleeves in summer, arm warmers in winter. 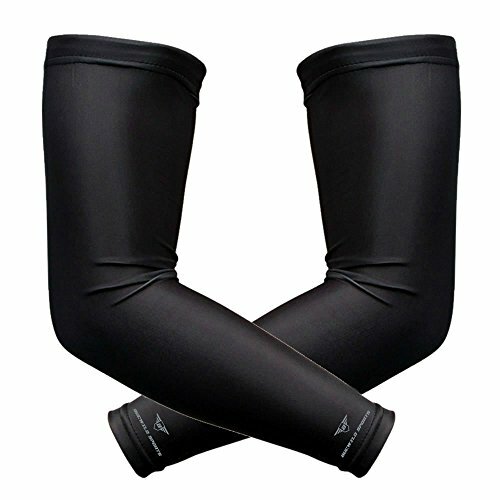 THE FINEST MATERIAL Moisture Wicking polyester/nylon mixture Not only keep you cool in the summer but also can wear it as arm warmers in winter. UV PROTECTION & COOLING ARM Block 99.7% of UVA and UVB rays. You can be rest assured being protected all day long while doing any outdoor activity. 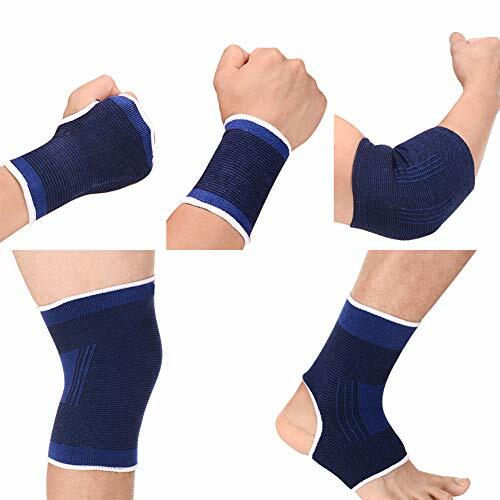 MULTI-FUNCTION & OUTDOOR ACTIVITIES Sports compression arm sleeves are perfect for athletes in baseball, football, basketball (shooter sleeve), volleyball, golf, tennis, bowling, running, cross fit, cycling, weightlifting, and much more. Features & Size: 1. Elasticity polyester material to allow for either a loose or snugger fit without cutting off circulation and permeability is strong. 2. One size,fits for 3-8 years old unisex kids. Functions & Occasions: 1. Our this kids' protective gear set can well protect your little honey's body part to the fullest, providing pain relief. 2. Fit for tensile strength for basketball,baseball,football,cycling, biking, running, jogging, training,outdoor & indoor etc. Ideal Gift: Perfect gift for your honey kids.Now your child can safely enjoy any outdoor activity and you can have that much-needed peace of mind! Notes: 1. Due to the light and screen setting difference, the item's color may be slightly different from the pictures. SOLD AS 3 INDIVIDUAL SLEEVES (not 3 pairs) 9 SIZES FOR A PERFECT-FIT With 9 available sizes, we are confident you will get a sleeve that fits perfect. 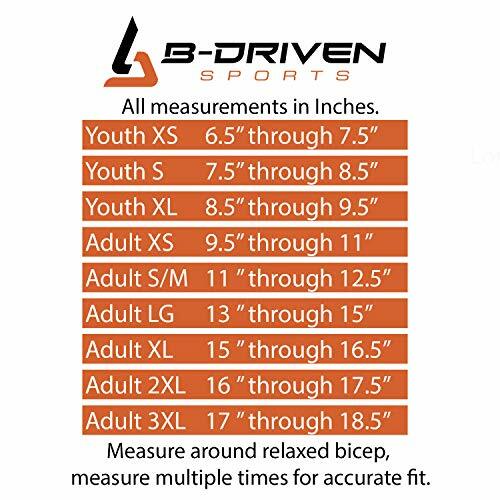 If you are not happy with the fit of your first sleeve, contact B-Driven Sports directly for a free exchange. Measure unflexed, relaxed area above bicep. All sizes measured in inches - | Youth SM: 6.5-7.5 | Youth 7.5-8.5 | Youth LG 8.5-9.5 | XS: 9.5 to 11 | S/M: 11 to 12.5 | LG: 13 to 15 | XL: 15 to 16.5 | 2XL: 16-17.5 | 3XL: 17-18.5 | GREAT FOR A WIDE VARIETY OF USES AND USERS The Pro-fit Arm sleeve is worn by Professional Athletes to Youth athletes, and are great for non-competitive activities as well. 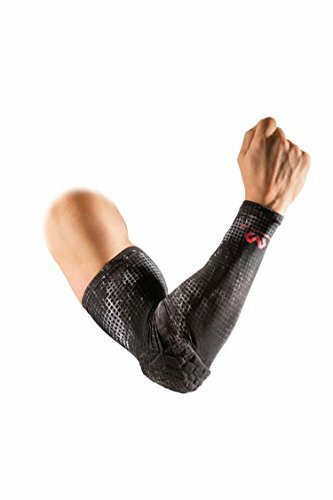 Weather you are looking for protection from the sun, injury prevention, or looking to reduce swelling and joint pain, the Pro-Fit sports sleeve has sleeve for you. 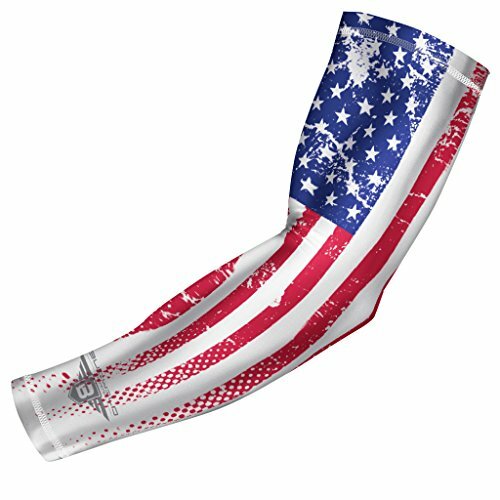 B-Driven Sports, Providing one of the world's largest selection of arm sleeves. OVER 40 SOLID COLORS AVAILABLE B-Driven Sports is located in St. Cloud, Minnesota. 3 generations strong, B-Driven Sports specializes in athletic and medical compression wear. 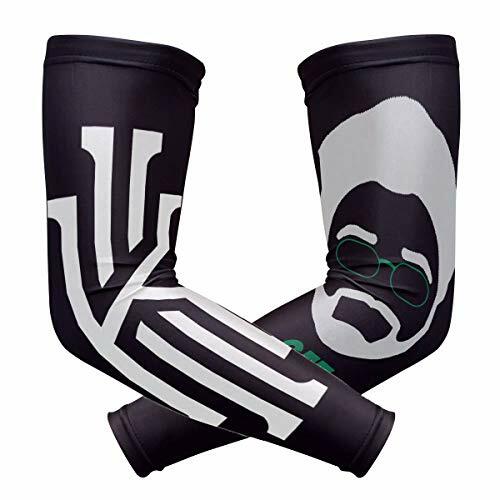 Besides our "Minnesota Nice" business approach, we are best known for our huge selection of unique designs and colors, with one of the largest selections of compression arm sleeves in the world, currently stocking over 1,200+ options. B-Driven Sports believes in providing a great product and a fair Value, topped off with great support. If you need anything, just let us know and we will be happy to help. INCLUDES 3 INDIVIDUAL SLEEVES | Please see our 6 pack listings if you need pairs. SATISFACTION GUARANTEE & SHIPS FROM THE U.S. | Contact B-Driven Sports directly for great service. SPECIFICATIONS | Non-slip band, 35 upf sun protection, moisture wicking, medium sports compression. SIZING | Please see secondary images or description below for sizing chart. If you want to custom your own pattern items, please do not hesitate to contact us!